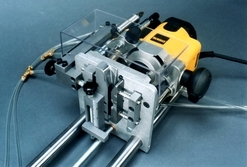 Edgewood Machine, Inc. is the foremost manufacturer of equipment for the window shutter manufacturing industry. Our products include the TRS-1, LS-3, RT-1, and LD-40. Jerry Alberts, President of Skyball Metalcraft Inc., originally developed and manufactured the shutter equipment in 1972 in Los Angeles, California. In 1988 Jerry turned the manufacturing of the equipment over to his nephew, Larry Davis, President of Edgewood Machine, Inc.
Edgewood Machine caters to Job Shop Machine Work as well. This includes: prototype machining, repair work, and custom machine work. Edgewood Machine specializes in Short Run Production. Please view our online brochure for detailed information on the individual shutter products.